Amazon is launching a new marketplace specifically geared at startups, called Launchpad. The Everything Store is partnering with Y Combinator, Andreessen Horowitz, and Indiegogo to source and vet startups for its new site. Each startup will get a product page where it can upload a product video and information about the startup. Startups on Launchpad will also be able to take pre-orders for products directly through Amazon, rather than on their company website, and Amazon will handle shipping logistics (it does this for all merchants on its platform). Joining Launchpad doesn’t cost startups anything upfront, just a commission on product sales. 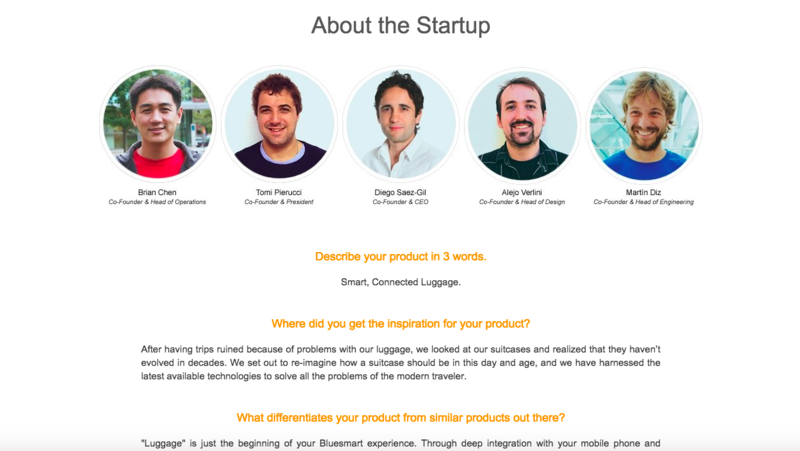 “It’s a lot about the story of bringing a new product to a market,” said Diego Saez Gil, CEO of Bluesmart, a connected luggage company. The products on Launchpad have a slightly different display page than other products on Amazon. This offers startups more opportunity to build out pages with product imagery and to tell their startup story, giving consumers a chance to connect with both the company and the product. Gil says Amazon was very hands-on with his company in terms of helping them to configure their product page around a brand strategy. Naturally, being on Amazon also helps his startup attract more eyeballs. “This gives us a chance to reach a bigger audience,” he added. Amazon isn’t the only one trying to capitalize on the current frenzy around startups. Earlier this year eBay began testing a new vertical called Innovators Collective. The experimental marketplace sells smart home devices made by small companies. Another startup, called Quirky, has also tried to create a hub for innovative smart products by manufacturing and selling crowdsourced inventions. Recently, though, the company has come up against some financial difficulties. Despite much interest in the idea, no company has successfully provided a home for small startups to sell their wares, which gives Amazon ample opportunity to dive into the market. Launchpad currently hosts 200 products in 15 categories, including mattresses from Casper, eero’s Home WiFi System, the Smart Sport Band from Wearables DVB, and the Soma Sustainable Pitcher & Plant-Based Water Filter. Rather than focusing exclusively on smart home products, which have yet to take off with consumers, Launchpad sells a broad spectrum of merchandise. Most importantly, Launchpad serves as an easy route for companies that have already gained a following through Indiegogo or Product Hunt to get their brand more exposure. Where Amazon will have to be careful is around discovery. Most people who shop on Amazon come to the site with specific items in mind. Since most consumers won’t be familiar with the products on Launchpad, Amazon will have to figure out a way to lead people to them. Historia previa ALERTA DE ECOSISTEMA: ¿Qué es E-Startup Coquimbo?